Facile punto di ritrovo. Personale cortese. Comoda imbarcazione, scenografica con le vele rosse. Bevanda inclusa. Spettacolo suoni e luci piacevole. Puntuale. 대부분의 다른 예약 사이트에선 예약가능일이 아니었는데, 여기서 바로 예약할 수 있었어요. 꼭 타고 싶었던 아쿠아루나 타게 되어서 너무 행복했어요. 와인이나 음료도 주고, 배에서 심포니 오브 라이트 구경하고 좋았어요. 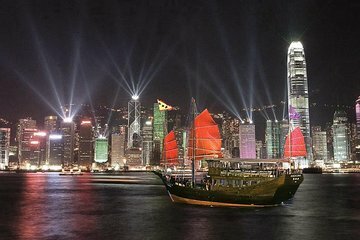 Excellent experience, fantastic cruise sampling the lights of the wonderful Hong Kong harbour. Great way to see the Symphony of lights. There is nothing like Victoria Harbor at night. For that, and for the experience of sailing on a junk, this is a must-do in Hong Kong! Lovely evening - light show was an extra but in our opinion not worth the extra money! Amazing view at night ! a lil steep on the price but the experience was great !